If you have never been arrested before, you might be a little curious what actually happens when a person is placed under arrest. As a professional bail bond company, we have seen basically every variation of this process and therefore, we thought we could shed some light on this process for you. After all, while you may not have been arrested in the past, no one ever really plans on ending up behind bars. At least if you know what the expect, your hypothetical trip to the local jail can at least be an informed trip. 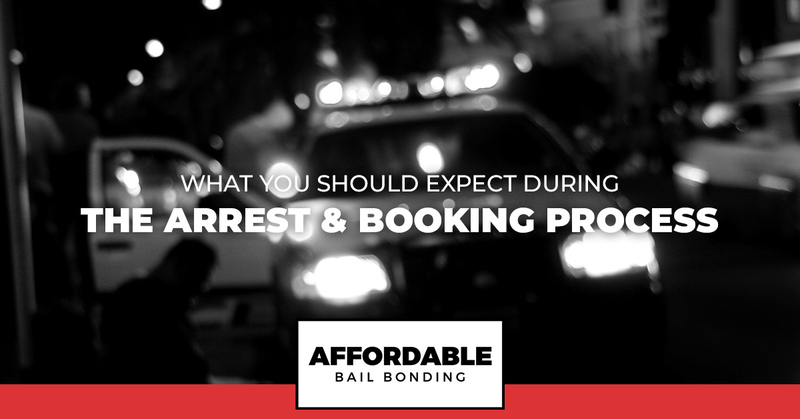 Continue reading below to learn what you can expect during the arrest and booking process. Before a person is able to be tried and convicted of a crime, there has to be a legal arrest that takes place and charges that must be filed. In some cases, a police officer will observe illegal activity, like a traffic violation. However, in the majority of situations, law enforcement has to act based on information they have been given by the general public. In nearly every case, a police officer must witness illegal activity or have reason to believe someone committed an illegal act before they can have a valid search warrant. Much of the time, police officers cannot make arrests without a valid and enforceable arrest warrant. In order for it to be valid, the warrant has to be signed by an unbiased judge after he/she has been provided with factual and legal support for the arrest. If this occurs, the person will then be arrested and booked which normally will include being photographed, fingerprinted and required to give their personal information. The first appearance the defendant has to make after the arrest will take place within hours of the person being detained. However, the exact amount of time will vary depending on which state you live in. When the first hearing occurs, the court will decide whether the defendant should be released or if they will have to post bail. If bail is going to be required, there will be a number of things that will be taken into consideration in order to determine the amount. These things are most commonly the severity of the crime, the likelihood that the defendant will flee and the existence or absence of a criminal record. This is also the point in the process that the defendant will be appointed an attorney to represent them if they don’t have the funds to pay their own lawyer. The next hearing that will take place is the preliminary examination/hearing. When this hearing takes place, the judge will look at all of the evidence that the prosecution and determine whether there has been a crime committed, and whether it there is sufficient evidence to prove that the crime actually did take place. If a trial takes place, the prosecution must prove throughout the trial that the defendant is guilty beyond a reasonable doubt. During the trial, the defendant also has a right to confront any witnesses against him or her, and may compel them to testify. Additionally, the defendant is given the option by the US Constitution to refrain from testifying against him or herself. At trial, both sides will introduce evidence that is both relevant and non-prejudicial, with all items being approved of ahead of time. Once the trial is over, the jury will take all of the evidence into consideration and determine whether or not the defendant will be convicted of the crime. While there are some crimes that require people to be handed down a mandatory sentencing, judges retain a good amount of discretion where sentencing is ultimately concerned. Once a judge has come to a decision about one or more sentences, he or she will them also decide whether to impose them consecutively or concurrently. Need the Help of a Bail Bondsman? If you happen to find yourself behind bars and you need to assistance of a trustworthy bail bond company in Lynchburg, we can help you at Affordable Bail Bonding. Call us anytime day or night and we will do everything we can to provide you with the assistance required for you to be released from jail.